And social mobility isn’t on May’s agenda either. Well, to be fair, who had even heard of them? And a “tsar” no less! This was a commission supposed to foster the ability of people in all walks of life to improve their lot through their skills and achievements. As May put it: “I want Britain to be the world’s great meritocracy – a country where everyone has a fair chance to go as far as their talent and their hard work will allow”. Alan Milburn, the Government’s social mobility tsar, who has chaired the commission since 2012, said he was quitting after months of “indecision, dysfunctionality and lack of leadership”, adding there was “little hope” of Ms May’s administration delivering a more equal society. We’re all long past the point of expecting May to accomplish anything herself. She’s a dysfunctional prime minister presiding over an incompetent cabinet desperate to avoid parliamentary scrutiny. Were meritocracy a reality, she and her cronies would be out already. It’s past time to haul the Tory clown car off to the wreckers. Author adminPosted on 3rd December 2017 3rd December 2017 Leave a comment on And social mobility isn’t on May’s agenda either. Here’s what I don’t get. Why is May so keen to ram Brexit through even without parliamentary approval when she doesn’t even have a majority? And why bother hiding the cost at all? It will all come out in the end when the bill is presented and the parliament and government of that day has to pay it. And we can be sure it won’t be hers, weak and wobbly as she is. There is a stench of anti-democracy in the Tory leadership. They are secretive because they are ashamed of what they are doing. Like criminals everywhere, they do not want to be found out. And the other thing I’d be interested in seeing is a comparison of the cost of Brexit to the cost of staying in Europe. Evidently that is something the woman who parroted the slogan “Strong and stable. Strong and stable! STRONG AND STABLE!! !”, only to go down in ignominious defeat, doesn’t want us to know. Author adminPosted on 3rd December 2017 Leave a comment on Why all the secrecy? The meeting took place at a Mayfair hotel and Mr Rees-Mogg described Mr Bannon as “an interesting man to have met”, it is said. It is thought they spoke about US and UK politics and the former senior adviser to the President also met with former Ukip leader Nigel Farage. And many Tories are talking about this guy as a future prime minister. Churchill must be spinning in his grave. Trump’s former national security adviser has pleaded guilty to lying to the FBI about what he did during the campaign. And apparently he is spilling the beans that collusion with the Kremlin was ordered by Trump. Or by Jared Kushner, Trump’s son-in-law and surrogate at the time. So far, Mueller has not directly investigated Trump. But we know the fish rots from the head down. Charge enough of Trump’s flunkies, and you get the man himself. Expect more frantic tweets from the orange orang-utan. Will Northern Ireland be May’s Waterloo, with May playing Napoleon? Theresa May has been warned that the EU will block progress in the Brexit talks if the Irish government decides that her proposals for the border with Northern Ireland are “unacceptable”. The European Council President, Donald Tusk, effectively handed Dublin a veto over progressing the talks onto future trade next month – the Prime Minister’s priority in the negotiations. “Let me say very clearly. If the UK offer is unacceptable for Ireland, it will also be unacceptable for the EU,” Mr Tusk said at a press conference alongside the Irish Prime Minister Leo Varadkar in Dublin. The peace in NI does depend on a porous border, and it is hard to see how that would remain, given May’s dunderheaded obsession with quitting the customs union. It’s not something the Taffeta Maiden can pull off. Membership in the EU was a major factor in getting peace in NI, and now May is willing to throw this peace aside just to placate the Brexiteers in her own dismal party. I despair of seeing any flicker of intelligence in this misgovernment. Author adminPosted on 1st December 2017 Leave a comment on Will Northern Ireland be May’s Waterloo, with May playing Napoleon? Soooo…. Donald tweeted support for a racist and fascist British hate group, Theresa’s people criticised it, Donald accused Theresa of being soft on terrorism, Theresa lashed back by claiming she wasn’t… and so it goes on. And on and on. So terribly grown up. There’s an elephant in the room some like to ignore. Theresa’s reluctance to break up with Donald. 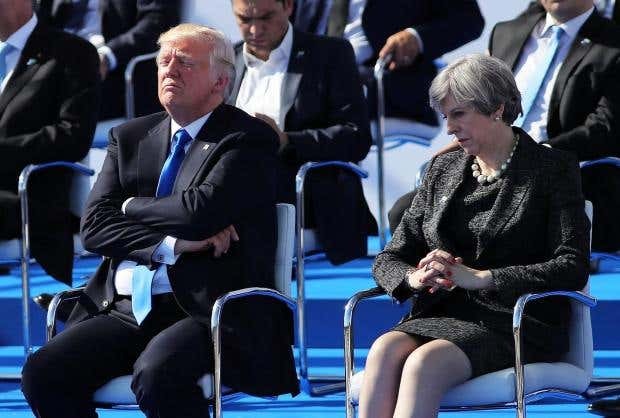 To give May a bit of credit here, I think she is very much aware that Trump is a petulant, bullying, small-witted, narcissistic man-child, whose only interest is himself, whose mental stability is questionable, and who cannot be trusted to keep his word, secrets, or trouser snake in his pants. The problem is, she can’t say it. I’m assuming she’s aware of it and hasn’t gulled herself into stupidity. Maybe I’m giving too much credit but for all our sakes, I hope not. She’s stuck herself with Brexit, which means she needs a deal with the US among others to replace it. She knows she can’t get a deal without massaging Trump. She also knows she can’t trust Trump. Nobody can. But to admit that would stop the deal in its tracks. And politically she needs a deal. She’s been hoist on her own petard, no way forward and no way back. I doubt Trump would agree to a state visit now, given the robustly antipathetic reception he’d deservedly get. And let’s face it, May isn’t likely to be prime minister by then. Plus, Trump has his onanistic fingers on the US nuclear button. Why risk enraging the orangutan? Who knows what might happen? May has dug this hole for herself, so I have no sympathy for her predicament. But what with everything, I think she is going through a lot of angst right now. Ah, that Irish border, always a source of strife. The Democratic Unionist Party has dramatically threatened to rethink its deal to prop up Theresa May in power if she compromises over the Irish border after Brexit. Sammy Wilson, one of the DUP’s 10 MPs, said the party would not accept any moves that would see Northern Ireland “treated differently than the rest of the UK”. Sounds like May is trying to have the best of both worlds: Northern Ireland in the EU while simultaneously not in the EU. Sounds like a quantum problem in physics. Physicists might find a solution, who knows, but I doubt May will. Ireland is what is going to scupper Brexit, because Ireland is what is going to scupper May. Author adminPosted on 30th November 2017 Leave a comment on Ah, that Irish border, always a source of strife. David Davis risks being held in “contempt of Parliament” after a row erupted over his refusal to release documents setting out the economic impact of Brexit. The cabinet minister will now be forced to appear before a Commons committee of MPs next week to explain why he has failed to hand over the papers – despite a vote in Parliament demanding their release. But as pressure mounted on the Brexit Secretary to give up the documents, Tory eurosceptics launched a counter-offensive pushing ministers to hold a second vote to ensure the papers are suppressed. Oh, my! Whatever could the Brexiteers be afraid of? The exposure of their lies before the referendum? What, in a supposed democracy, is there to fear from publication of reports on the potential consequences of Brexit? Its cancellation? Oooooh! Perish the thought. 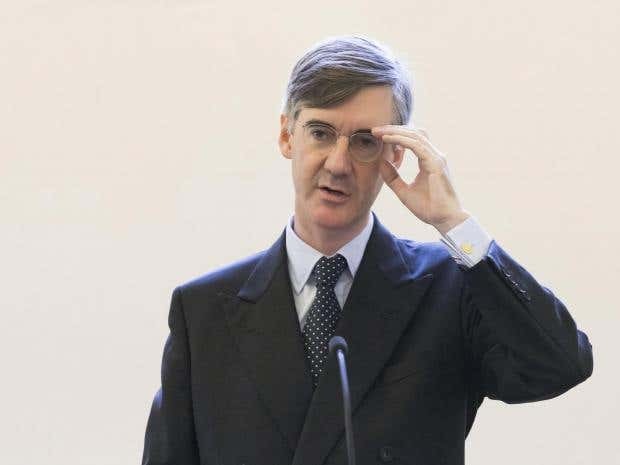 At the very least, it might fuel debate – ooops, sorry, I forgot the Tories think debate is the last thing we should have on this most fateful decision of post-war Britain. Who knows, a debate might result in The Wrong Decision, one that May and her cronies disagree with. May’s misgovernment has strong anti-democratic instincts, and is not fit to continue in power. If parliament’s will is not to be done by a rag tag and bobtail of xenophobic Tory blowhards kept in office by Northern Ireland’s version of UKIP, then wash them away. Get rid of the scabrous bunch. Ooops. The virtues of the free market. I noticed in other news a hotel in NY city was removing Trump branding, and his Florida Mar-e-Lago resort has been reduced to accepting bookings from far right organisations as opposed to charities who have been falling over themselves to cancel. Apparently he has also benefited MSNBC’s – another media outlet accused of being “fake news” by The Donald – advertising revenues, and the NY Times has reported a surge in subscribers. For a lot of people, Trump is a toxic brand, resulting from his toxic personality and government. The most threatening toxic waste dump in the US is the White House.